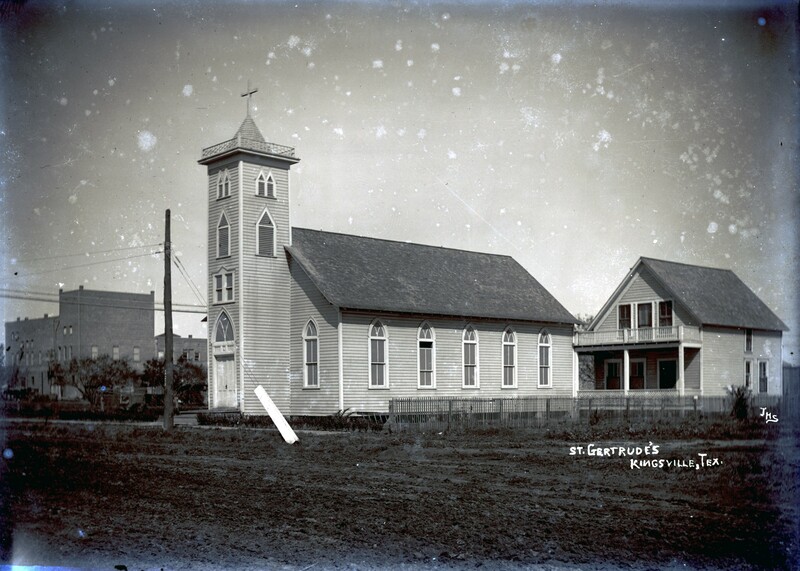 The first Catholic services in Kingsville were held in February 1908. Several years later the Reverend Joseph Como became the first resident pastor of St. Gertrude Church. A hurricane in 1916 badly damaged the church building, but it was replaced and made serviceable. 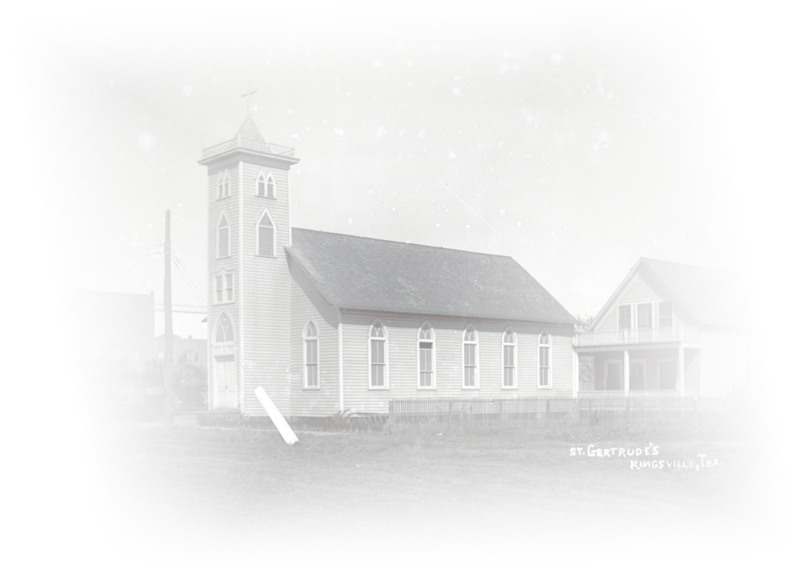 However, in September 1919 a hurricane completely destroyed St. Gertrude Church. Until a new church was erected, Mass was celebrated in private residences. In 1920, under the direction of Father Erasmus Goeckner, C.S.P., a substantial brick and tile structure was erected on the old site. In 1925, St. Gertrude Church suffered another calamity due to fire, where the entire interior roof and equipment were completely destroyed. Over the next ten years, St. Gertrude’s was renovated extensively, and was one of the most attractive Catholic Churches in the Corpus Christi Diocese. During the years around WWII, the City of Kingsville began to grow and consequently the number of parishioners at St. Gertrude increased. Realizing that the present facilities would not be adequate, the church, under the direction of Msgr. George Baumgartner, acquired 8 acres of land located on the corner of Caesar and 8th Street with the intention of building a complete and new parish facility. 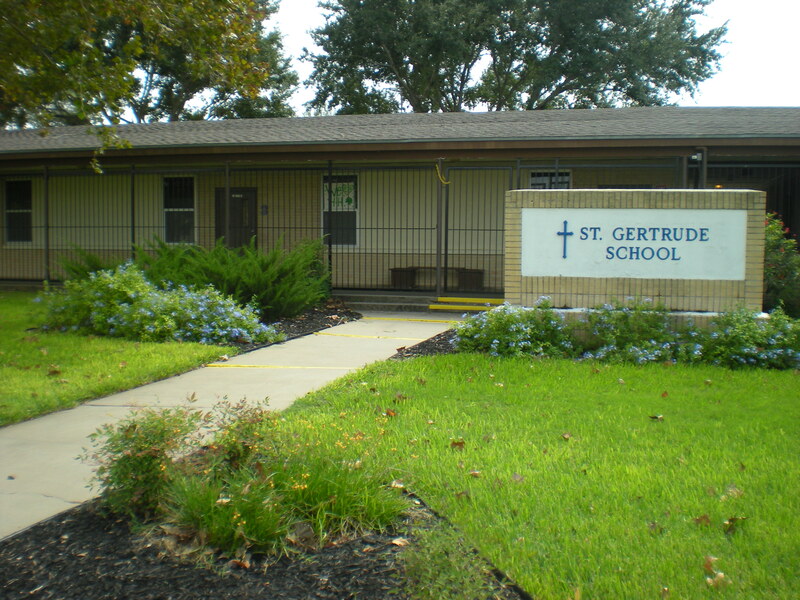 The first building erected on the new property was St. Gertrude School. The school opened in September 1951 and was conducted by the Sisters of Incarnate Word and Blessed Sacrament of Corpus Christi. In February 1957, the construction of our present church began and was completed in November of the same year. It was dedicated by the Most Reverend M.S. Garriga, Bishop of Corpus Christi on December 9, 1957. On December 8, 1982, the Most Reverend Thomas J. Drury, Bishop of the Diocese, celebrated the Silver Anniversary of St. Gertrude Church. The Golden Anniversary was celebrated by Most Rev. Edmond Carmody on November 16, 2007, the Feast of St. Gertrude the Great. St. Gertrude Church has divinely and strongly served the Catholic community of Kingsville and the surrounding areas for over one hundred years. To better meet our needs for the future, the Church, over the past several years has been conducting careful and measured planning. This planning is based upon input from parishioners who conducted a facility feasibility study under the direction of Father Roger Smith and continued under the leadership of Father Piotr Koziel. As a result of this study, the present church has been refurbished and a new rectory built. The prior rectory building has now become the parish offices, which also includes the St. Gertrude Outreach Ministry. We then moved with Father James Stembler, who helped our parish to grow spiritually and physically with greater involvement through stewardship of time, talent and treasure. We now welcome Father Joseph Lopez who will continue to spread the Word of the Lord and help us to grow in faith. St. Gertrude was orphaned at a very early age and was raised in the Cistercian Abbey, of Helfta, Eisleben, Saxany. She was very intelligent and became very interested in philosophy. She could read and write Latin, but was reproached by Christ, in a vision, for seeking wisdom of the world. From that time forward she studied the Bible and the works of the Church Fathers. Our Lord and Our Lady appeared to her many times, giving her revelations about Heaven and about how the Holy Family lived here on earth. They also gave her instructions on how to live a holy life. Her writings encouraged devotions to Our Lord and Our Lady, and her works were greatly praised by Saint Teresa and Saint Francis de Sales. 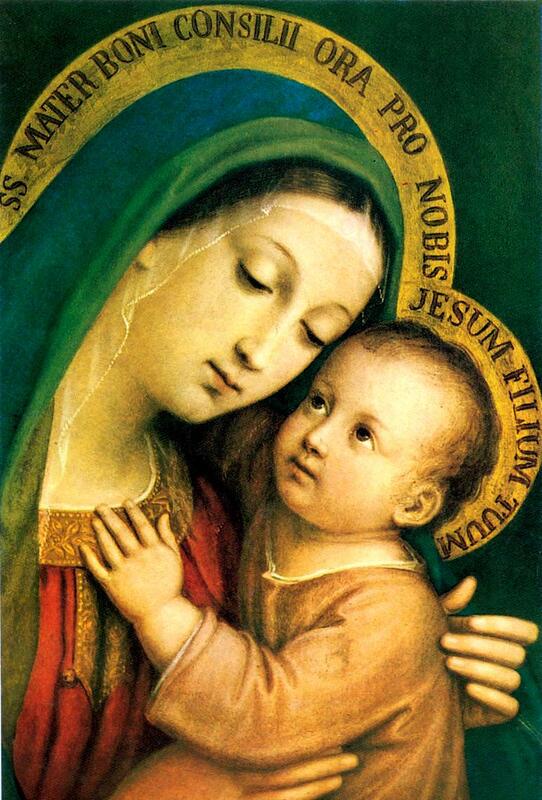 November 16 is her Feast Day. "Eternal Father, I offer the most precious blood of thy divine son, Jesus, in union with the Masses said throughout the world today, for all the holy souls in Purgatory, for sinners everywhere, for sinners in the universal church, those in my own home & within my family. Amen."